I–SHOUT–OUT.org, is an anti-hate non-profit organization whose sole mission is to stop intolerance by speaking up and speaking out for those who cannot. To do that, we must confront intolerance at its very root – bullying. The Holocaust and other tragedies all stem from that very root. That is why we have an obligation to halt intolerance at its source. 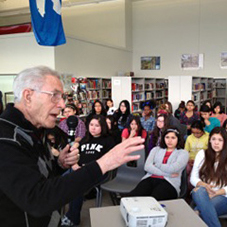 Founder, Holocaust Survivor and Author, Ben Lesser speaks to children about his own experiences with intolerance and how he overcame the many challenges associated with hate. Ben teaches the kids to be strong, never be a bystander and speak up to SHOUT–OUT for themselves, loved ones and even the millions of souls that were silenced. His message makes an incredible life-long impact. We have learned that every child who participates in our online movement stands by their testament helps eliminate the cultural intolerance that occurs in our school system today. Tolerance education encourages positive behavior for a peaceful tomorrow. Every dollar associated with each SHOUT–OUT helps us continue spreading the message to stand UP, not be a bystander and SHOUT for what is important. Your contribution helps further our mission to spread awareness through educational programs, speaking events, and online resources to work towards combating hate. So join us as we SHOUT–OUT against all forms of intolerance. SHOUT–OUT. LIKE US. SHARE IT.